A 2003 drawing depicting U.S. Marines wearing the Marine Corps Combat Utility Uniform in desert and woodland-camouflaged variants. 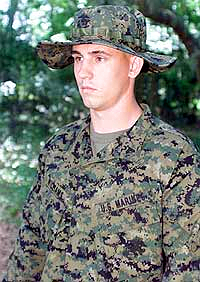 A U.S. Marine wearing the MCCUU in woodland MARPAT in 2001. The Marine Corps Combat Utility Uniform (MCCUU) is the current battledress uniform of the United States Marine Corps. It is also worn by Navy personnel (mostly corpsmen, chaplains, and their bodyguards) assigned to Marine Corps units (e.g. the Fleet Marine Force). It replaces the Battle Dress Uniform, which the Marine Corps had shared with the Navy, Army and Air Force. However, both the MCCUU, and its distinctive camouflage pattern, MARPAT, are exclusive to the Marine Corps, which holds the patents to their design, and are not available to the civilian market. MARPAT is available in two color schemes, woodland and desert. The uniforms are manufactured by Propper International Inc., American Apparel, Inc., E.A. Industries, American Power Source Inc., and Columbia Sewing Company. The MCCUU should not be confused with the similar looking FROG uniform. Two U.S. Marines test out early predecessors to the MCCUU in 2001. The two prototypes feature removable sleeves, a feature that was later abandoned on the finished production version. Field testing of the MCCUU began in early 2001 and was officially announced to the public in June 2001. Early prototypes had featured removable sleeves, but that design feature was later abandoned. The patent for the MARPAT pattern was filed on June 19, 2001, whereas the patent for the MCCUU uniform was filed on November 7, 2001. The uniform made its official debut at Camp Lejeune, North Carolina on January 17, 2002, and the changeover was completed on October 1, 2004 (with a few exceptions of April 1, 2005), a year ahead of the original deadline date set in 2001 of October 1, 2005. The early prototypes of the MCCUU were designed by Propper International and American Power Source. The collar of an MCCUU, being worn by a U.S. Marine sergeant in 2002. The rear of an MCCUU, being worn by a U.S. Marine in 2002. The MCCUU is intended for wear in the field or for working parties, but has become the typical working uniform for all deployed and most garrison U.S. Marines and U.S. Navy sailors. Initially the variety worn depended on the environment and season: Deployed Marines wore whichever color is more appropriate to the climate and terrain, Marines in garrison wore the woodland MCCUU in winter months, and the desert MCCUU in summer months. However, the Marine Corps announced on December 8, 2016 that the desert pattern would no longer be worn in garrison. Instead, the woodland MCCUU will be worn year-round, with the sleeves rolled up during the summer and down during the winter. Until recently, the sleeves of the blouse were normally worn rolled up while in garrison during summer months. However, the Uniform Board announced that as of October 24, 2011, this will no longer be allowed. This decision was later reversed when Marine Corps Commandant General James Amos announced on February 25, 2014, that the Marine Corps will return to its former standard of rolling up the sleeves while in garrison during summer months, effective March 9, 2014. Unlike the previous BDU, the MCCUU was designed to be used with body armor, which previously restricted access to front pockets. To further distinguish the uniform, upon close examination, the Eagle, Globe, and Anchor can be found within the pattern. Its use as a combat uniform has led to some strict regulations for wear in garrison: unlike the U.S. Army's ACU, the MCCUU may not be worn off base, although it may be worn when commuting to and from duty in a privately-owned vehicle. Dismounting for incidental stops en route off of a military installation is no longer permissible excepting legitimate emergencies only. The trousers are worn bloused over the tops of the boots with the use of elastic bands (nicknamed "boot bands") or metal springs. In the field, the boonie (floppy) cover can be worn, not authorized for garrison wear. The Marine Corps Eagle, Globe, and Anchor is embroidered on both the boonie and utility covers. An olive drab green t-shirt, or skivvie shirt, without a logo is worn underneath the blouse. Due to the intense heat in Iraq, moisture wicking t-shirts, such as those produced by Under Armour became very popular. However, due to concerns that the shirts would melt to the skin in the event of a fire or explosion, they are banned when a Marine is deployed to a combat zone. However, the Marine Corps has worked with Danskin to develop their own moisture wicking shirts under the "Elite Issue" line, ultimately creating and issuing the Flame Resistant Organizational Gear to troops likely to be exposed to combat. The MCCUU is worn with a webbed rigger's belt earned through the Marine Corps Martial Arts Program. The belts are tan, grey, green, brown, or up to six degrees of black, depending on the Marine's proficiency. 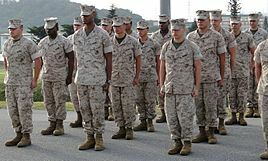 Uniform regulations still authorize a web belt for wear for Marines that have not qualified in MCMAP; however, the Commandant of the Marine Corps directed in 2008 that all Marines will qualify. This directive rendered the wear of the item on the MCCUU to new recruits in basic training or to those who have lost their MCMAP belt due to not being proficient in the MCMAP. The Marine Corps now requires tan rough-out combat boots, either hot weather or temperate weather versions. Commercial versions of this boot are authorized without limitation other than they must be at least 8 inches in height and bear the Eagle, Globe, and Anchor on the outer heel of each boot. Stains and damage to the boot make them unservicable for wear, as well as a heel with excessive wear. When the MCCUU was first being fielded in 2002, the black leather boots that were worn with the woodland BDU were authorized to be worn with the woodland MCCUU in the absence of the tan suede ones, though now, only the latter are authorized. Marines from pay-grades E-1 to E-9 wear black insignia. Marine officers wear polished insignia in garrison, subdued (flat black and brown to replace silver and gold, respectively) or none in the field. Most badges and breast insignia are authorized for wear on the utility uniform, shined or subdued as appropriate. Landing Support Marines also wear the Red Patch insignia. ^ "COMBAT UTILITY UNIFORM AND BOOT GUIDANCE > The Official United States Marine Corps Public Website > Messages Display". www.marines.mil. ^ "MANDATORY POSSESSION DATES FOR THE MARINE CORPS COMBAT UTILITY ;UNIFORMS (MCCUU) AND MARINE CORPS COMBAT BOOTS (MCCB) > The Official United States Marine Corps Public Website > Messages Display". www.marines.mil. ^ ‹See Tfd›US 6805957 "Camouflage U.S. Marine corps utility uniform: pattern, fabric, and design." ^ Oliva, Mark; Childs, Jan Wesner (July 3, 2001). "Officials went to the source to ensure new Marine uniform pleased troops". Stars and Stripes. Archived from the original on July 25, 2001. Retrieved July 25, 2001. ^ Starr, Barbara (June 20, 2001). "From Cammies to Pixies? : Marines Dump Old Wrinkled Duds for Permanent Press and Pixel Patterns". ABC News. ABC News Internet Ventures. Archived from the original on June 25, 2001. Retrieved June 25, 2001. ^ "Camouflage pattern for sheet material and uniforms US D491372 S1". Retrieved September 24, 2013. ^ "Camouflage U.S. Marine corps utility uniform: pattern, fabric, and design US 6805957 B1". Retrieved September 24, 2013. ^ United States Marine Corps. "U.S. Marines Combat Utility Uniforms 2003" (PDF). United States Department of the Navy. United States Department of Defense. Archived from the original (PDF) on April 9, 2008. Retrieved April 9, 2008. ^ "New uniform debuts today". Around the Fleet. Marine Corps Base Quantico, Virginia. January 17, 2002. Archived from the original on September 19, 2013. Retrieved September 19, 2013. ^ Jontz, Sandra (February 24, 2001). "Marines' followed Canadians' example in use of digitally-designed 'cammies'". Stars and Stripes. Archived from the original on June 6, 2002. Retrieved June 6, 2002. ^ Pike, John. "Marine Corps Combat Utility Uniform". ^ Commandant of the United States Marine Corps (September 22, 2004). "MARADMIN 412/04: MANDATORY POSSESSION DATES FOR THE MARINE CORPS COMBAT UTILITY UNIFORMS (MCCUU) AND MARINE CORPS COMBAT BOOTS (MCCB)". United States Marine Corps. United States Department of the Navy. Archived from the original on September 29, 2004. Retrieved September 29, 2004. ^ OHara, Katy. "Marine Corps Ditches Desert Camouflage for Seasonal Uniforms". ^ "United States Marine Corps". ^ Military.com. "Military Life, News, Entertainment & Fitness Resources". Military.com. United States Marine Corps Uniform Board (September 2001). "Marine Corps Combat Utility Uniform". United States Marine Corps Training and Education Command. Archived from the original on September 19, 2001. Retrieved September 19, 2001. United States Marine Corps Uniform Board (September 2001). "Combat Utility Uniform Camouflage Considerations". United States Marine Corps Training and Education Command. Archived from the original on September 20, 2001. Retrieved September 20, 2001. United States Marine Corps Uniform Board (September 2001). "Combat Utility Uniform - Conceptual Background". United States Marine Corps Training and Education Command. Archived from the original on September 19, 2001. Retrieved September 19, 2001.